Let me start off by saying that this cold weather has already gotten old. Yesterday we saw below-freezing wind chills for the first time this winter. Today is not much warmer, and the forecast through Thursday predicts temps in the 30s, with rain and snow mixed in for good measure. It's typical west-central Indiana weather. I want to turn the attention towards some things that are a little heavier in nature. For the past few days I have been thinking about two recent events that have made me consider my role as a reporter, as well as what it means not to have an answer to difficult questions. I think many are now aware of the interaction between Catholic students and a Native American protestor who was attending the recent Indigenous Peoples March in Washington, D.C. A short video that went viral showed a student named Nick Sandmann wearing a MAGA ("Make America Great") hat and mocking the elder. The students had also been in Washington to attend the March for Life. However, the video shared on Twitter which ignited the controversy was cut down from a longer video showing them being taunted by a group called the Black Hebrew Israelites, who are not recognized by the wider Jewish community. The Native American man allegedly tried to intervene in the back-and-forth between them and the students. Sandmann then stares him down with a kind of smirk. The above is also relayed in a recent article in the Washington Post, which I trust much more than the right-leaning newsies like Tucker Carlson, Breitbart and LifeSite who have been on full blast. As a member of the press, I find their ranting humorous, if not a little disconcerting. They also tend to jump on the bandwagon to condemn "leftists'" intentions while denying them any kind of doubt or criticism. The reaction from people on social media was part of the story. That does not translate to the "mainstream media" "siccing" on the students and the behavior they exhibited in the Twitter video. The news cannot control if the longer video surfaced later on through a single person, and unless a source goes full detective, we, much more than you probably understand, can only report what we're seeing in the moment. As such, more context has since come to light about the encounter. The students, who also come from an all-male school, do not get a pass for being idiots and framing their hooting and hollering as school spirit (as a Wabash grad myself, give me a break). Turning away from that topic, another recent event also made me think about having answers to questions that demand critical thinking and more compassion. 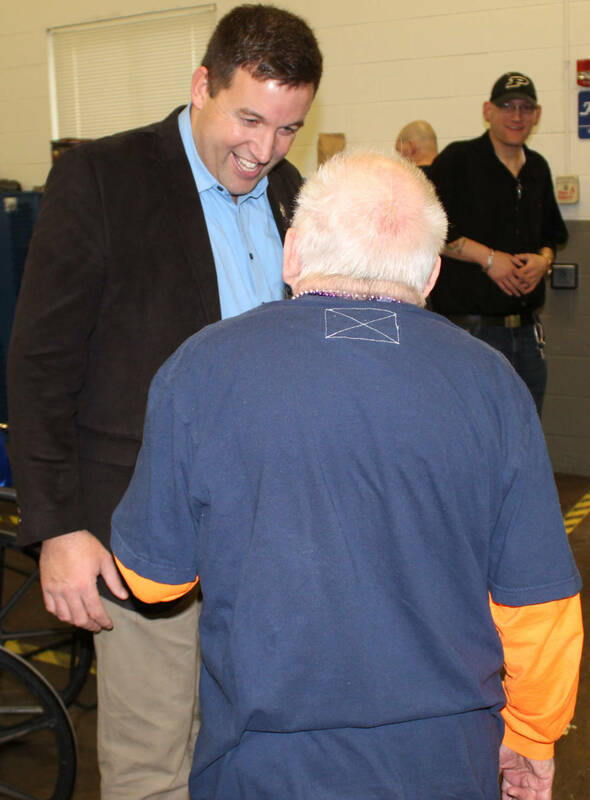 This kind of encounter occurred when I was taking pictures of Indiana State Sen. John Crane as he toured Putnam County Comprehensive Services last Friday. As we were completing the tour, I was stopped by a PCCS consumer who asked me what turned out to be a very striking question. "Do you know that I'm retarded?" he asked me. He was slurring his speech, so I asked him to repeat the question until I finally pieced his question together while trying to take a picture. "Then what am I?" he responded quietly. It was at that point that I started looking around, because I didn't know what to do. I found PCCS Consumer Relations Manager Stacie Langdon, who seemed to look back at me as if she knew exactly what was happening. I felt immediately ashamed and, frankly, somewhat defeated. I looked back at Stacie, who still smiled. If there was a kind of Socratic discourse that made me think a little bit more about those challenges and those who have more humanity in them than I do, that was it. Actually, they do: it's called the 1st Amendment. As a "member of the press," I fear for your career if you fail to remember the very constitutional artifact you clearly depend on to post opinions of 16 year-old "idiots" that smirk at toothless drum-beating dolts and the vile epithets that were hurled their way. DouglasQuaid: It's apparent to me from this comment (and others which you have posted on other articles) that you can't think critically or read between the lines. What wasn't mentioned directly in this post is that those kids were also passing off a "tomahawk chop" (which is considered a racist gesture towards Native Americans, but as if you'd care about that) as what they called "school spirit." You really think that should be ignored, much less scrutinized? Their gestures are "free speech" on their own, but that does not mean whatsoever that those actions are free from the criticism of others. Your automatic reference to the First Amendment as an end-all is a weak, unnuanced argument. Talking about racism, you referring to the Native American elder as a "toothless drum-beating dolt" speaks plainly enough. Jokes aside folks, none of this has anything to do with race, but being the cute little lefty I'm sure you are, you already knew that. People like you only need to see the MAGA hat to justify anything and everything you do regardless of whoever is involved. And toothless drum-beating dolt? I was being kind. "The news cannot control if the longer video surfaced later on through a single person, and unless a source goes full detective, we, much more than you probably understand, can only report what we're seeing in the moment. As such, more context has since come to light about the encounter." 2)Stop trying to be so politically correct. You look foolish. There is nothing wrong with the term "mentally retarded" when used as a factual descriptor and not as a pejorative. Again, its called context. (Before you start hyperventilating the word "retard" means "delay or hold back in terms of progress, development, or accomplishment" so someone who is mentally retarded is someone who is held back in terms of mental development.